Thierry Legault is part of a network of skywatchers armed with sophisticated astronomical gear to monitor the whereabouts of spacecraft. Round and round it goes … where it stops, nobody knows. NASA's out-of-control Upper Atmosphere Research Satellite (UARS) — a nearly 6 1/2 ton spacecraft — is ready to nosedive into Earth's atmosphere later this week and some expert skywatchers have even managed to spot the massive spacecraft from the ground. 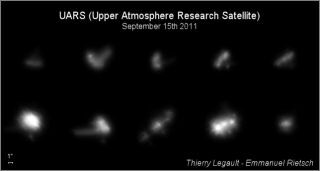 Where over the Earth the derelict UARS satellite will make its fiery fall still remains a guessing game for NASA. But meanwhile, a global network of skywatching satellite sleuths is focused on the downfall of UARS. Thierry Legault is an amateur astronomer. "The satellite appears to be tumbling, perhaps because a collision with satellite debris a few years ago," Legault told the skywatching website Spaceweather.com. "The variations in brightness are rapid and easily visible to the human eye." Other eagle-eyed skywatchers have reported brilliant flashes from the UARS satellite that were nearly as bright as Venus in the night sky. "During the three or so minutes I had it in view, the satellite slowly rose in brightness from about magnitude 3 to 0, then suddenly flared/flashed in brightness to about -2 or -3, then quickly dropped off to near-invisibility. Then the whole sequence began anew," Rao explained. "It did this a total of three times before it vanished behind the treetops in my southeast. The thing must be tumbling." According to a NASA update, as of Sept. 20, UARS was cruising in an orbit approximately 127 miles by 140 miles (205 kilometers by 225 kilometers). Re-entry is expected Sept. 23, plus or minus a day. UARS will re-enter somewhere between 57 degrees north and 57 degrees south. That means the spacecraft will fall into the Earth's atmosphere at latitudes anywhere from northern Canada to southern South America — a swath that pretty much encompasses all 7 billion people hunkered down on the globe. About 26 large chunks of the satellite are expected to survive and become heat-defying hardware that will punch into our planet’s surface, but it is also very possible the satellite will fall unseen somewhere over the sea. Statistically speaking, according to NASA debris experts, it comes out to a chance of 1 in 3,200 that one person anywhere in the world might be struck by a piece of UARS debris. "The risk to public safety or property is extremely small, and safety is NASA's top priority," NASA explained on its UARS website. "I think the biggest story here is how the event has been taken out of context," said Don Kessler, who led a recent National Research Council blue-ribbon panel study, "Limiting Future Collision Risk to Spacecraft: An Assessment of NASA’s Meteoroid and Orbital Debris Programs." "It seems that everyone I've talked to seems to worry that this is something they should be very concerned about," Kessler told SPACE.com. "The 1-in-3,200 probability has been interpreted by some as being 'per person,' rather than 'per 7 billion people.' That makes the chance of any one person having to worry about it to be less than 1 in 10 trillion." There are several predictions from satellite surveyors around the world now percolating via the Internet: From re-entry near the East Coast of Australia or over the South Island of New Zealand, maybe over the West Pacific near the northwestern coast of Japan. So pick one … or none at all.